Have you tried SIP DECT phones? Right now, I have two phones on my desk: SAXA's IP NetPhone SX as my main phone and also the Snom m3 DECT phone. After my teammate completes the interoperability tests with SIP devices, I love having the chance to play with the new gadgets that we receive for testing. The SAXA phone always gives crystal-clear sound quality, which I can rely on for any important calls that I need to attend or record. It also has a great speaker, which is very convenient when I have another person joining the call at my desk. So how about the DECT phone? As far as I can remember, Snom has been around since the beginning of SIP IP telephony. Because of Snom's long history of telephony technology, I am very comfortable using their phones with Brekeke PBX. 1. 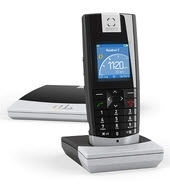 DECT phones provide mobility in the office without interfering with any other WiFi networks in the building. 2. They're very light-weight compared to other SIP WiFi phones that I have tried in the past. Since DECT has a dedicated radio frequency, it's supposed to provide good voice quality. I'm not sure that I can confirm that at this point. The call I had the other day was pretty bad, but it may have been caused by the other party. I'll play around with this a little more and will report my experiences to you all. I also plan to play with Polycom's DECT phone, so I'll let you know about that as well. Also, I found this PDF document "The Wireless Experts Selecting DECT or Wi-Fi" at Polycom's site today that you might want to check out.